No short story this week, because I wanted to talk about something else. Obviously, today is Valentine’s Day, and couples all over the world will be enthusiastically (or resignedly) celebrating the requirement to be extra super squishy romantic tonight. That’s great, if you’ve got someone (don’t forget to stay safe, kids), but Valentine’s Day has never been particularly happy for me. In 2007, we had a big ice storm and I took a hard fall that left me with excruciating, debilitating back pain for the next eight months. It was my senior year at Mount Holyoke and I was taking extra classes to make up for a semester off earlier in my career, including PE, from which I was not allowed an exemption. Needless to say, it was a difficult time, and my spine is still feeling the lingering effects. 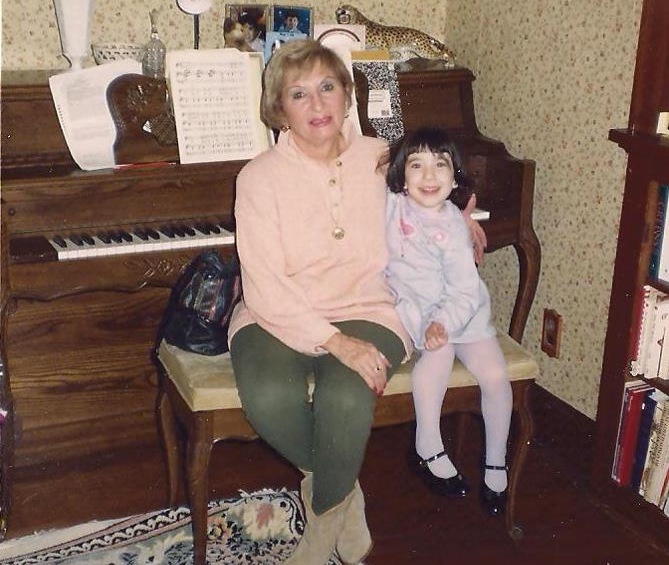 Two years later, on Valentine’s Day, my grandmother died with very little warning. I called my mom that evening to wish her a happy holiday, and was met with the news that Mommom, as we called her, had died in her sleep the night before. While she was notorious for a litany of low-grade health complaints, she was also rather disinclined to go to the doctor, and so succumbed to walking pneumonia at age 86. She was not an apron-and-apple-pie grandmother. She was stylish and full of irreverent humor and was married three times. She had four children, losing one to cancer, and loved her apartment right on the sea. She read voraciously and listened to Frank Sinatra, she went out to concerts and spent time at Bloomingdales and Loehmann’s. She doted on her Siamese cat, Guido, and signed all her birthday cards with his picture alongside her X’s and O’s. I get my fierce love of jewelry from her, and now proudly wear pieces from her beautiful collection each and every day. I have art from her walls on my walls, these days, and am constantly reminded of the complex life she lived, surrounded by lovely, colorful, imaginative things. We explored Japan together for nearly two weeks when my uncle got married there, and I will always treasure that time. She was always wearing (and losing) her big sunglasses, whether she was taking me to the mall or the beach or coming for a Sunday visit, as she did every week. She never learned to drive, so my mother would go down to Long Beach and pick her up. I would sit in the back seat and listen as she gossiped about people I’d never met. And when I was fourteen, she and my mother sat me down and told me that I needed to lose weight, dress better, and cut my hair because no one would ever love or respect me the way I was, which remains one of my most searingly painful memories. 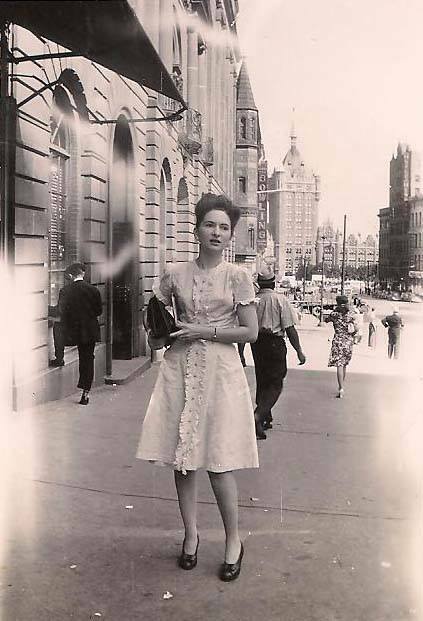 A few days after she died, I drove down to New York so we could fly to Florida and start to settle her affairs. I got severe food poisoning from a sandwich I ate the day before we were supposed to get on the plane, and spent the entire night delirious on the bathroom floor. I remember my mom’s face when she brought me some tea at 3 in the morning, so tired and full of grief and unable to do anything to make either of us less miserable. I learned more about her in the days following her death than I had during her lifetime, when I was too young to understand most of the things she had gone through. A strict, spare childhood; an abusive first husband; an affair with a man she would go on to happily marry until his sudden death changed everything. My mom and I sat on the floor of her empty apartment and sifted through black-and-white photos of my ancestors. The great-grandmothers I was named for. The one who accidentally killed her infant twins by scalding them in the bath. The immigrants who came to New York from Russia and rose from nothing to be doctors and engineers. Through her loss, I found a thread of connection to a past I was only vaguely aware of. While I can’t say the benefits outweigh how much I miss her, love is about finding a way through the inevitable sadness of life and death. I don’t have a Valentine this year. I’ve never had one any other year, either, despite the fact that I’ve cut my hair at least a few times since I was fourteen. Dating is not something I’ve ever been very competent at, and I have to admit that today does nothing more than remind me that it’s always been impossible for me to achieve even a shadow of such a connection with another human being, no matter how much I want to or how hard I try. But thinking of my grandmother on a day like today helps me remember how tightly she would squeeze me when she gave me a hug. It helps me remember bright pink lipstick on my cheek and how much I looked forwards to sleepovers at her house, when we’d get a movie from Blockbuster and stop in to gaze at the trinkets next door at Pier 1. If I was lucky, her cat would come out of hiding and curl up next to me on the pull-out sofa bed, and I’m reminded of how much her brilliant life and constant love shaped my early world. I’m fortunate to have had such an influence in my childhood, even if I didn’t always agree with some of her views or her actions. I’m fortunate to have learned what I learned from her, and I’m sorry she can’t see the person I’ve become since she died. If she could, maybe she’d tell me not to worry so much about Valentine’s Day. After all, it’s a day dedicated to love, and she always had plenty to spare. That’s always the worst part, isn’t it? No matter how happy you are to sit on the couch with takeout and Netflix, someone will always try to offer their condolences.